As a long time lover of Collection 2000 Perfecting Minerals, I was more than excited to hear that the company now known simply as ‘Collection’ were relaunching the product. It’s been off sale for over 2 years now so I had to stock up on ebay, yes, it’s that good. I’ll admit, I have no idea what is so good about mineral make up, that’s not the factor that appeals to me (but click here if you want to read more about mineral make up). I just know that I have never been impressed or bothered by powder foundations before but this one gives full coverage and doesn’t look powdery at all. What I really love about it is the fact that it effortlessly gives you a flawless finish every time. It’s one of those foundations that you literally can’t put too much on as it doesn’t cake up or look weird, it just looks more and more perfect with each application. You can apply it over just moisturiser for a lighter finish or use it over a liquid foundation for perfection. I prefer using it over foundation (currently the Benefit Oxygen WOW, I know committing all kind of beauty crimes there!) and it works over any foundation I’ve tried, even Boots Natural Collection tinted moisturiser which has had a massive slating across blogs! But every time people compliment me on how nice my skin looks, and my skin hardly ever looks ‘flawless’ I can tell thee! So, the first thing we notice about the relaunch is the obvious change in packaging. I’m not going to beat around the bush; I really really do not like the new packaging. I can’t really make it any clearer than that but I will go into more detail later on in the post. Yes, it’s going to be a long one! The next different is the colour range. In the old packaging it came in 3 shades; Ivory, Honey and Beige. Now unless they have Stevie Wonder working on the naming of the shades, I’ve no idea where they get the idea that Ivory is darker than the Beige one from. Honestly. I had to choose ‘honey’ as it was the lightest colour in the old range regardless of the fact (to me) honey would tend to describe something more orange toned? Ivory was the most orange in the range with beige being slightly more brown but lighter than Ivory. Confusing, right? I have noticed with a lot of Collection foundations the colour name does not match the colour itself. Excuse the bad phone image, but taken in the store, the confusing colours continue in the new range. They’ve simplified it and gone for just 2 shades; light to medium and medium to dark. BUT the top one in the image is actually the light to medium and appears DARKER than the medium to dark which is at the bottom?! So I chose the medium to dark which is something a pale faced gal like me would never usually have to do. When I got home I compared the colour against my ‘honey’ shade and there was little difference at first. Please do excuse my lack of knowledge when it comes to describing foundations, I don’t claim to be a guru and be able to tell you hues or pigments or anything like that! So the biggest difference for me, as I have said, is the way the product is packaged. The old pot is perfect, it came with a very good brush anyway, but I prefer to use a buffing brush now as it adds to the flawless effect and it’s much easier to knock the excess powder off and build the finish with more ease. 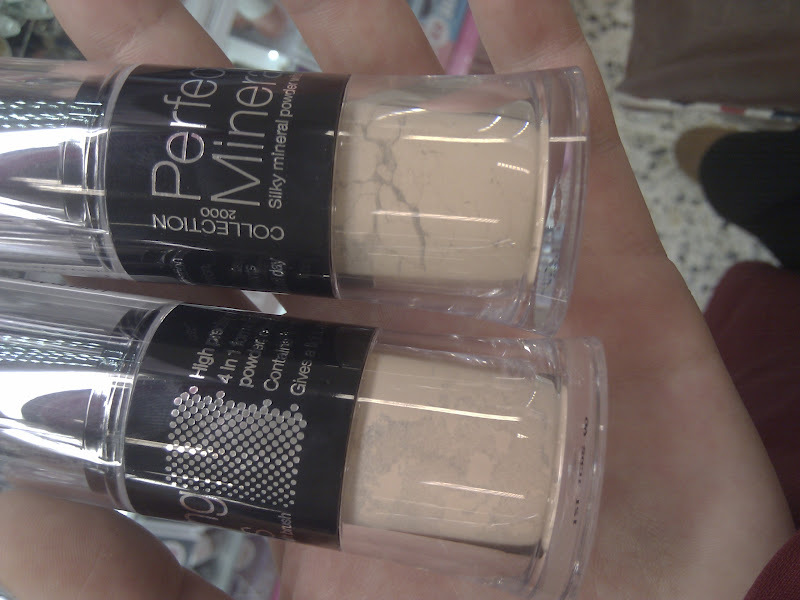 Honestly, best foundation EVER! In the new packaging, well, where to begin? It’s one of those awful retractable brushes that to get any to the end of you have to like jolt forward until it appears at the end. This has actually put me off purchasing a few blushers due to the concept, and the fact you waste so much product by just trying to get it into the brush! The brush it way too soft to apply the powder thoroughly to the face and you notice big dusty clouds of it going everywhere as you apply. It’s messy, it’s awkward, it’s completely pointless and stupid when the old design was so much simpler and easier to use! And possibly even cheaper to produce! Another factor I noticed in the new design was that it failed to state how much product is in the container. I’m sure that’s a bit illegal isn’t it? Like, isn’t everything meant to say how much it contains?? Anyway to see how much product I was getting (or not) for the same price as the product was originally retailing for, I got an empty pot of the same size to pour it in…. I think this speaks for itself really. The original pot only contained something like 15g anyway, so for the same price it seems I got about half the amount I originally got. You can also see the difference in colour too, that doesn’t bother me as the new one is perhaps more suited to my skin tone. But, medium to dark? Are you kidding me?? Now I’ve just checked the ingredients for both and they do appear to be the same formula. Which is brilliant. It does seem to glide on and create the same flawless finish with the buffing brush. –Why the change in packaging to make me feel so short changed? -Why the backwards colour names? -Why not say the weight of the product within the pot? -Why fix what isn’t broken in the first place?!?!?! Don’t get me wrong I am more than happy to have it back on the shelves but I shall continue to buy the old version online for the same price but twice as much product, but now at least I know when the supply runs dry this is the back up. But tut tut Collection it’s almost like you thought we wouldn’t notice.